In 2002, the Hayman fire swept through 138,000 acres of the Pike National Forest in Colorado, becoming the largest forest fire by burned area in state history. More than ten years later, a new U.S. Geological Survey report details the fire’s stunning effects on water quality and flood flows of streams receiving runoff from burned area. Stream sediment loads, trace element and nutrient concentrations were analyzed for five years after the fire in a stream running through a burned watershed. With data from a stream in a similar but unburned watershed nearby, almost every dimension of water quality spiked after the fire, according to Michael Stevens, a USGS hydrologist and author of the report. One way that the burned landscape affects water quality is by supercharging runoff after storms. 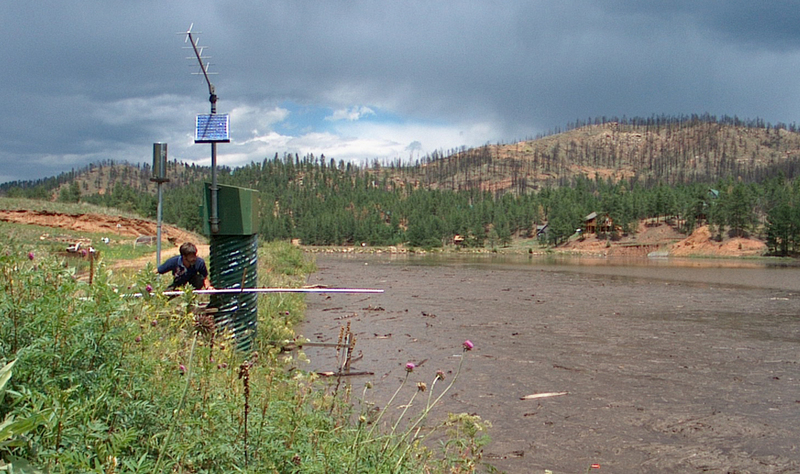 When 2.2 inches of rain fell on the Hayman area in July 2006, flows in West Creek took only 45 minutes to jump from 62 cubic feet per second to 2,170 cubic feet per second. 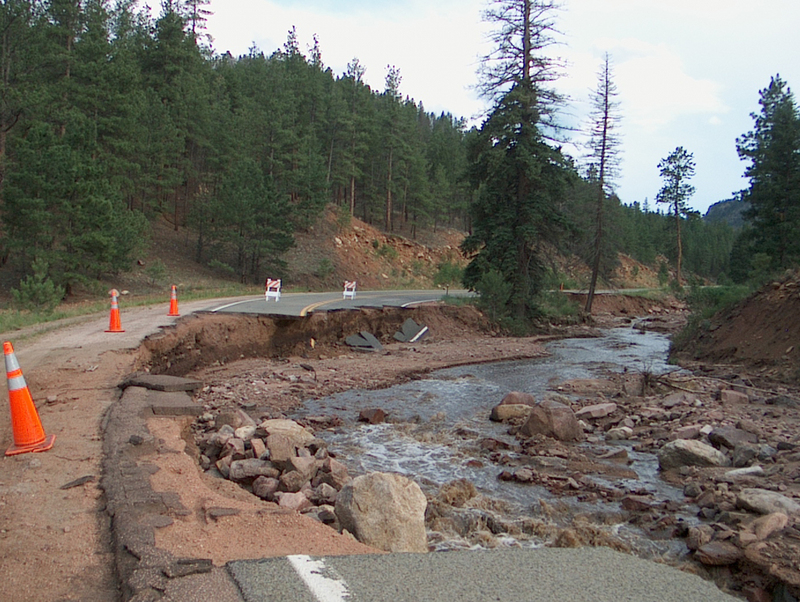 The resulting flood chewed through Colorado Highway 67 and caused $11 million dollars in damage. The increased runoff from the Hayman fire area carried an increased load of nutrients such as ammonia, nitrate and orthophosphorous into Fourmile Creek, the study stream with a burned watershed. In 2003, dissolved nitrate and orthophosphorous concentrations were generally an order of magnitude higher in that stream than they were in Pine Creek in the unburned reference watershed. The greater runoff also picked up much more sediment than usual, and the effect on Fourmile Creek wasn’t subtle. The total suspended sediment load from April to September in the first year after the fire was 1,160 tons per square mile of drainage–nearly three orders of magnitude larger than Pine Creek’s 3.22 tons per square mile. Sediment filled a lake at a A YMCA camp at the bottom of Fourmile Creek more than once, Stevens said. From 2002 to 2005, crews excavated 40,000 cubic yards (an estimated 59,000 tons) of sediment from the lake. That helps provide some elusive context for just how much sediment has washed off the the burned area. Though the data from 2003 show some alarming spikes in water quality constituents, an analysis of nutrient and sediment concentrations in the proceeding four years also shows a watershed in recovery. Suspended sediment concentrations in Pine Creek since the fire, for example, dropped roughly by half each year over the course of the study.